Buy 1 for $8.08Buy 2 / Save $0.43!Buy 3 / Save $1.62! Harpagophytum procumbens DC. (Pedaliaceae), commonly called Devil's Claw; in German, Sudafrikanische Teufelskrallenwurzel. Devil's claw comes from a plant native to the Kalahari and Namibian deserts. Its roots are said to resemble a claw. The active ingredients are found in the roots and tubers, with nearly twice as much active ingredient, harpagoside, in the secondary tubers as in the primary. Commercial producers buy dried slices of the tubers which are then converted to powder form or extracted. Traditional herbalists have used devil's claw to help support everything from upset stomach to boils. At the turn of the century, German physicians began using devil's claw to help support symptoms of joint pain. Devil's claw can be used as an anti-inflammatory, analgesic, and to help stimulate appetite and digestion. Devil's claw can be used to help support dyspepsia (upset stomach), loss of appetite, and degenerative disorders of the locomotor system. Extracts injected into animals fight the swelling induced by trauma. They also appear to help support the pain induced by experimental injuries. The component thought to be responsible is called Harpagoside (members of the general class of Iridoid glycosides). The problem here is that Harpagoside both stimulates the release of, and is destroyed by, stomach acid. The highly variable rate of absorption may explain why clinical researchers have reported conflicting results. Some researchers have found that patients with joint pain find support; others have found that use of the herb produced no measurable benefits. Commission E recommends a dose of 1.5 grams per day to help stimulate appetite, and 4.5 grams per day for muscle sprains and upset stomach. Since it appears that most of the herb will be destroyed in the stomach, enteric coated formulations might be preferable. Barring that, taking the product with an antacid would also be a good idea. The evidence suggests that devil's claw stimulates acid secretion, and patients being treated for ulcer disease might find themselves feeling even worse. Also, there is some evidence that devil's claw works by altering the same enzyme systems that are effected by NSAIDs (nonsteroidal anti-inflammatory drugs) such as AdvilTM (ibuprofen). Someone already taking an NSAID should probably not take devil's claw at the same time. Significant toxic side effects have never been reported, and devil's claw is not known to interact with any other medications. 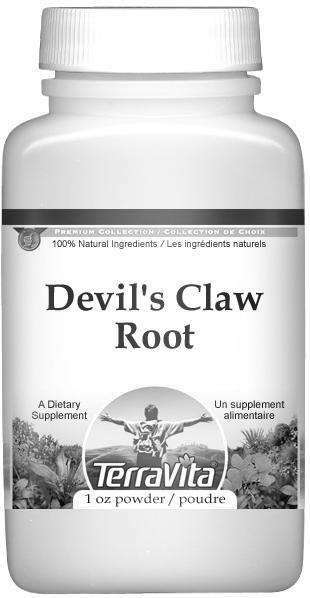 There are no reports of devil's claw products interfering with routine workplace urine drug screening tests.